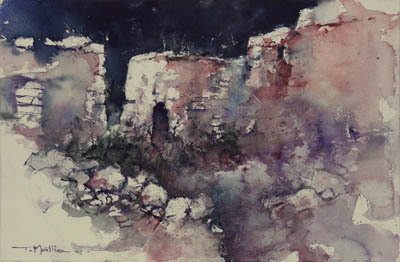 Tonio Mallia’s watercolour paintings are irresistible. Their fascination unfailingly draws the viewer closer. Though they may appear bleak, yet each work bristles with indomitable energy. The painter relentlessly experiments with the watercolour medium with the aim of discovering new ways of expression. Mallia successfully makes use of powerful composition, effective manipulation of light and shadow, together with suspenseful climatic conditions, to finally achieve a thrilling result. Chromatic effects are achieved by the excellent handling of the aquamedia, including the blending process or wet-in-wet. Some colours appear to glow while others seem to be deposited sediments in the hills and valleys depicted on paper. 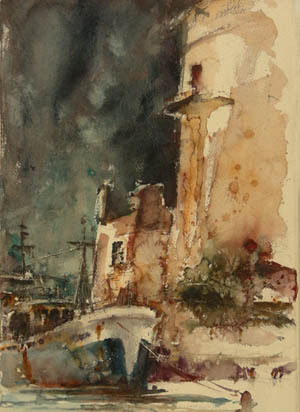 Mallia’s works are to be found in numerous local and foreign collections. The artist has exhibited his works in various solo and collective exhibitions and has consistently drawn positive reviews. art..e Gallery is situated at 1, Library Street, Victoria, Gozo. The gallery is open daily from 9.15am to 12.15pm. Private viewing may be arranged by phoning 99804774, 21557911 or by email artgallerygozo@gmail.com.